Our God is not dead – He is ALIVE! On Easter Thursday, we will ponder the hope of the empty tomb and the relics of the Resurrection. Experience the power, moment and meaning of Christ’s Resurrection through an encounter with the Shroud of Turin, the Veil of Manoppello, and Sacred Scripture. 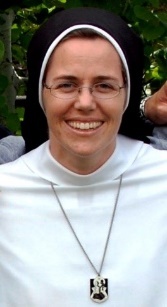 Sr. Maximilian Marie Garretson, O.P., is a member of the Dominican Sisters of Mary, Mother of the Eucharist in Ann Arbor, Michigan, and a native of Oregon. After earning her Bachelor of Arts degree and Apostolic Catechetical Diploma from Magdalen College, she served as Youth Coordinator at St. Mary Catholic Church in Corvallis, Oregon. In 2001, she answered God’s amazing invitation of love to become His bride as a consecrated religious. Since entering the community, she has earned a bachelor’s degree in Elementary Education from Eastern Michigan University, and a Master’s in Educational Leadership from the University of Southern Mississippi. Sr. Maximilian Marie spent five years in California as principal of a pre-K through 8th-grade school, and recently returned to the States after four years in Rome, where she served as the librarian for the Pontifical North American College. She currently serves as Relationship Manager at the Sisters’ Mission Advancement Office in Ann Arbor, Michigan. The Dominican Sisters of Mary, Mother of the Eucharist was founded in 1997 to spread the witness of religious life across the country in response to St. John Paul II’s vision for a New Evangelization. Their apostolate follows upon preaching and teaching the Truth in order to gain souls for the Kingdom of Christ. Media appearances: Oprah, The American Bible Challenge, NPR. Good Morning America, Today Show, BBC and EWTN & others. To learn more, visit www.sistersofmary.org. Registration table opens at 11:15 and program begins promptly at noon. This entry was posted in past events on March 5, 2018 by suejosecretary.